You don't have to live on the San Andreas fault line to be concerned overt unwanted vibrations and their effect on your music. I can not only hear the garbage trucks outside my house at the start of each week but feel the vibration caused by the mechanical arm that slam-dunks a week's worth of trash into the top of the truck. Audiophiles with children will also understand how the pitter patter of little elephant feet can make even the steadiest-tracking CD player uneasy. Controlling unwanted resonances ensures that your system is performing to par. If your system can sound best at all times, you are more likely to sit down and listen to an entire CD from inner to outer edge. The audio rack where I stack all of my stereo equipment uses spikes and decoupled shelves to help in this endeavor. However, I still have to be careful of walking too heavily on my suspended second-story floor or my CD player will skip. Spikes and decoupled shelves only go so far. I needed a more effective solution. The EquaRack MF-1 Multi-Mount Footers are resonance control devices that use viscous-elastic materials to convert vibrational energy into heat. That is the briefest explanation I could glean from the EquaRack site. It contains a lot of information so I took notes while reading and then experimented manually with the Footers to achieve the best sound. 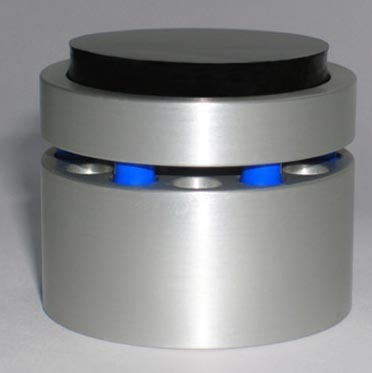 Each footer assembly is composed of two machined aluminum discs, a viscoelastic top layer and an array of tiny blue pellets made from a compressive rubbery material. The footers included a plastic cylinder sleeve that is necessary to align the two footer halves during assembly, involving the insertion of the right amount of pellets to create optimal load bearing for the component you intend to support. 1) Place the thick footer on the shelf where it will be used with your audio component. 2) Arrange the appropriate amount of blue pellets in the machined holes in the large footer. It takes less pellets than you think to offer the greatest sonic benefits. 3) Slide the plastic cylinder over the thick footer half. 4) Place the thin footer half on top of the pellets so the pellets fit between the concentric grooves. The plastic cylinder will help center the footer. 5) Place the black viscoelastic disc on the smooth top. 6) Carefully slide the plastic cylinder off the assembled footer. 7) Repeat steps 16 two more times to assemble three complete footers. 8) Arrange the Footers in a triangular shape to support your component. 9) Carefully lower the component on top of the footers so it is positioned for maximum stability. If you dislocate the pellets in a footer, you will have to fix it before placing the component on top. 10) Pour a cup of iced berry tea to calm your nerves. I played around with the little blue pellets until I was red in the face. Because most of my components are relatively light, I used as few pellets as possible and settled on three arranged in a stable triangle. I did not trust that two would keep these little towers of fanaticism from tilting. 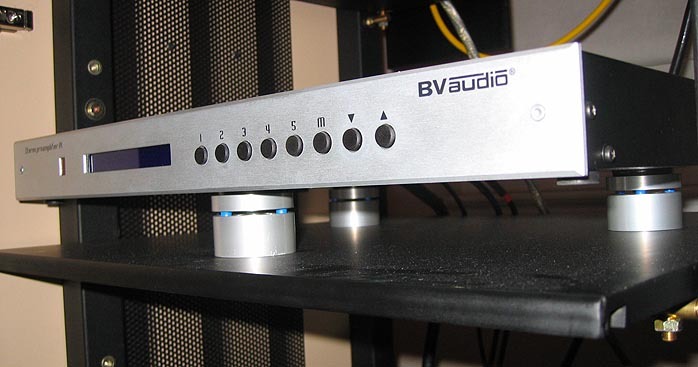 My BVaudio P-1 preamp is very light so two pellets per Footer might actually sound better because the viscoelastic blue stuff then operates under proper compliance. When I tried placing the preamp on assembled twin-pellet footers, the pellets hit the fan, figuratively speaking. Resonance control is great but not if you have to sacrifice a $1,500 component to get it. 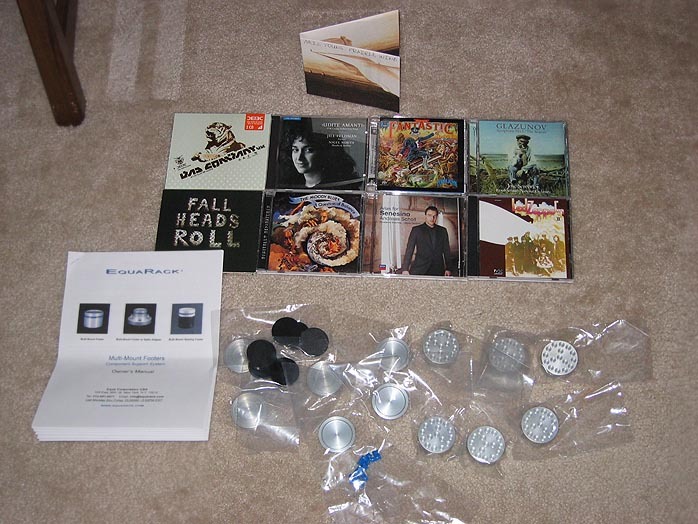 I ended up with three of the footers with three blue pellets each under my preamp and three under my CD player; two in back and one in front. Triangles are supposed to offer the best stability. Of course stability is a relative term. Once such lightweight components are placed on the footers, switching cables or pressing buttons becomes a more delicate process that must be handled with extreme care. Two beers and a heavy hand could send your entire system reeling. I mention this only to help people who might be a little clumsy at times. Of course reviewers are never clumsy. In spite of all my cautious griping, I did not once launch my preamp or CD player to the floor during this review. In fact, aside from handling my system with greater care, the footers and everything stacked on top of them stayed put and stable. Because setting up the footers was finicky, quick ABA comparisons were not possible. After completing the setup, I wanted nothing more than to relax with some good music. Luckily the effects of the footers were immediately apparent. All of the precarious positioning of the fancy footers resulted in improvements across the board kinda like changing your clothes after a long day at the office. You are the same but everything feels better. The frequency range sounded as if it were enhanced, not extended beyond what my system is capable of reproducing but fresh as though the footers helped my equipment make better sense of my recordings. The fact that the EquaRack Footers are effective does not mean that my audio components are defective. They simply helped my components sound their best by minimizing interference. With the footers in place, sonic images enjoyed enhanced focus. The whole musical picture had been run through the car wash and sounded like new. I started listening with a familiar piano recording of the complete Mozart sonatas performed by Klára Würtz [Brilliant Classics 92268 2005]. The recording does justice to the instrument and includes a decent amount of room ambience. With the footers in place, the hall acoustics were easier to understand and to distinguish from the sound of the instrument. The tone of the instrument also sounded better as the "Turkish Rondo" spun around my listening room. The music flowed beautifully and was appropriately enchanting. Removing the footers did not make things sound terrible but they did sound less exciting. Now my equipment had to wrestle with other forces instead of just playing back the pits on my aluminum discs. It was like the difference between walking twenty feet and walking the same distance in the 4' deep end of a swimming pool. The music sounded hampered and somewhat sluggish. The piano did not have quite the same sparkle in the right-hand registers and the acoustic space surrounding it sounded blurry by comparison. Larger-scale music, whether acoustic or amplified, also sounded closer to the live experience. Mahler's 8th Symphony is probably one of the best tests of how a system can avoid sounding congested [Naxos 80550533-34 2006]. The orchestra, soloists, choruses and organ sounded best when I had the footers under my equipment. The footers enhanced my system's ability to distinguish the musicians and singers that make up such large ensembles without distorting or making the individual contributions sound washed out. The entire picture seemed appropriately large, certainly larger than with the footers removed. important as proper speaker positioning, room treatments and the unwanted step children of power conditioning and cables. Some equipment manufacturers ignore resonance control entirely and leave it up to the consumers to fix the problems. It certainly removes one expense in bringing a product to market. My BVaudio components only have simple rubber feet, presumably to save money for the more expensive parts inside. The EquaRack Footers were an essential upgrade for these components and even benefited my already resonance-tweaked Audio Refinement Complete CD player. Interested parties should visit the EquaRack website and start taking notes. The time spent in careful setup of these layered footers will reap generous rewards!